A woman standing on grass, in profile facing left wearing a long muslin dress, which is plain white and bunched at her torso. The sleeves are elbow length with some decoration. She is holding a fan in both hands, which is hand decorated in pink with green and blue concentric circles and lines. 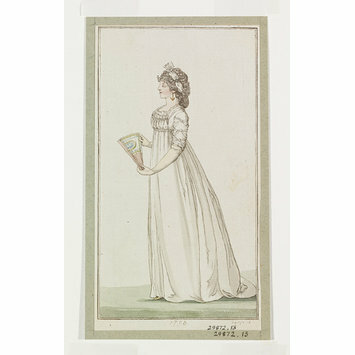 She is wearing off-white gloves, which meet the sleeves of her dress at her elbow. She has a white fabric headband in her grey hair, fastoned with a blue round clasp, and is wearing gold earrings in the shapes of anchors. 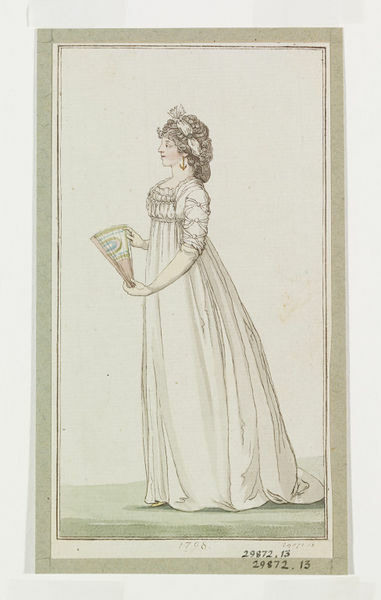 Fashion plate from Journal des Luxus und der Moden, April 1798.